If we were having coffee, I would talk about what a crazy month May has been. There was crazy weather--it started out cold and then it got warm. Really warm. We're talking Deep South warm and humid. It was also really rainy. According to the weatherman, this was the rainiest May on record for the Chicago area with over 8 inches of rain. I'm glad it's warm, but a little moderation aka spring would have been nice. It wasn't just the weather. 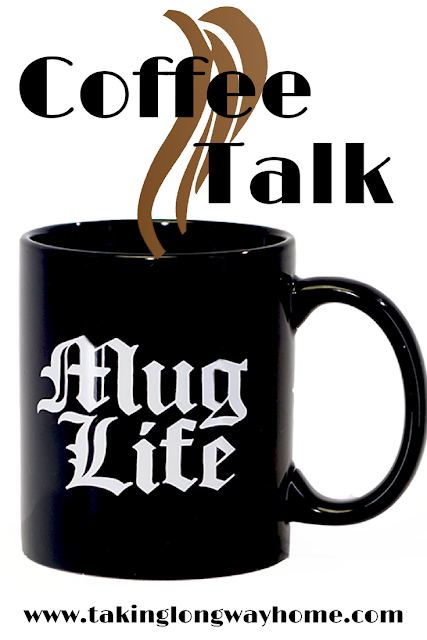 If we were having coffee, I'd talk about how crazy busy May has been. May is always super busy for most parents, but this year my youngest son graduated from high school. We also had awards night and sports award night on the calendar. There was also prom which was the same weekend as graduation. Don't ask me why they do it that way--I'm sure there's a reason--but it made for a hectic weekend. Can I just say it? I'm so proud of him! I'm also proud that I didn't cry, although I came very close. I'm pretty sure the tears will flow when we drop him off at the University of Wisconsin in the fall. No worries, we'll still have my oldest son living with us while he continues to get his act together. 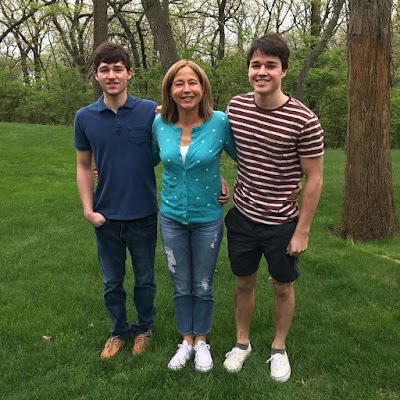 If we were having coffee, I'd tell you that my youngest and I are road tripping to Madison, Wisconsin this weekend so he can take his placement tests. The UW hosts placement test in the Chicago area, but he insisted on going to Madison to take them. We're spending the night and while he takes the tests, I'm planning on a long run along the Lakeshore Path. After the test, we're going to have lunch and rent SUPs on Lake Mendota. It will be a lot of fun plus anytime I get to spend time with either of my boys, I'm happy. Bonus points if they are both involved. 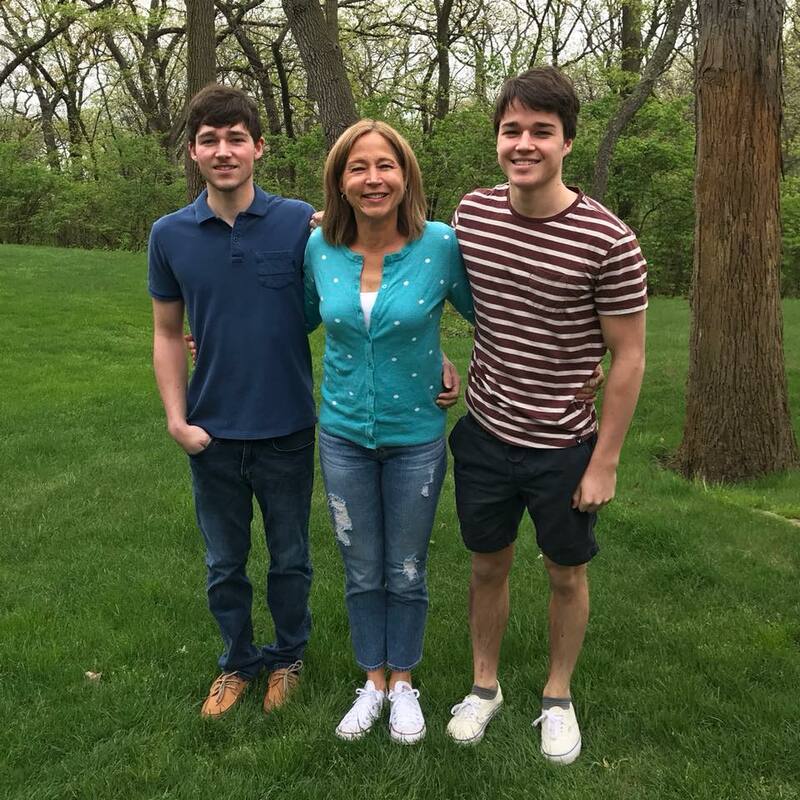 One happy mother on Mothers' Day! If we were having coffee, I'd tell you that we've almost cut the cable! This past month, I bought 2 HDTV antennas and installed them. They work amazingly well. The TV in the family room doesn't get all local the channels yet--we have to move the antenna to an outside wall. This will involve drilling a hole in the wall and that's something I need my husband to do. As soon as that happens and I make sure that we get all the channels, bye-bye Comcast!! We rarely watch anything on cable and we have an Amazon Fire Stick for streaming, so I'm looking forward to going retro and saving $$. I've talked your ear off! What would you tell me over coffee? Has the weather been crazy by you? Was your May super busy? Any trips out of town planned? Do you have an antenna or do you still have cable? 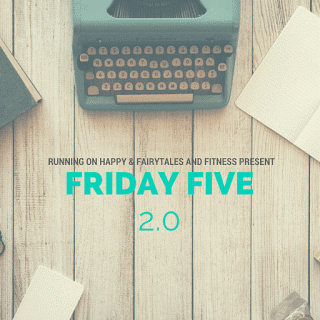 I'm excited to link up this post with Fairytales and Fitness and Running on Happy for the Friday 5 as well as Coco and Deborah for the Ultimate Coffee Date! We survived MAYhem! Have so much fun in Madison. I forgot to tell you we stopped there on the way back from La Crosse. For a little college visit. Such a cute town. I'll be traveling there often this year, so let me know if you'd like to join me! I keep the landline for all the spam calls! We are still in our crazy grad week(s) stuff! Congrats to you and your family! I bought that same congrats balloon for our party Sunday. Good news from the Dr!! We still have verizon tv which is so $$$ my hubs is obsesses w all his shows so I don't think we will cut the cord anytime soon. 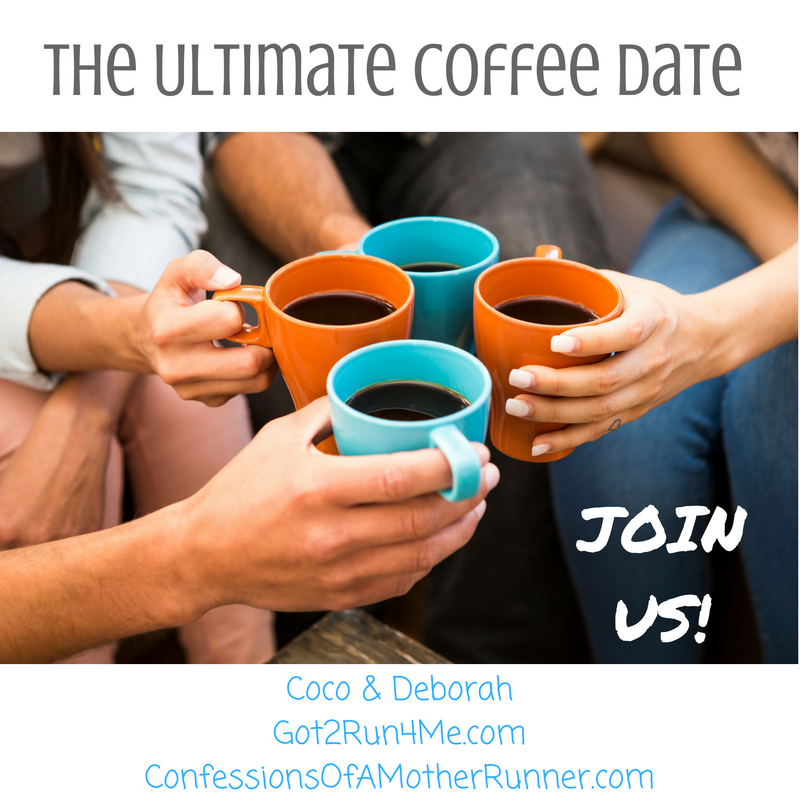 Thanks for joining us for cofee! Funny story about the balloons--on Sunday we had a front blow through and when I came home from my bike ride, all that was left was the "S"! My neighbor texted me because she found the "A" in her yard. Don't know where everything else went. You certainly had a very busy May, but filled with good things! So happy to hear that your bloodwork came back great at your doctor's visit. Ultimately I would love to cut cable also as it's getting SO expensive! I feel like there are so many channels I don't watch and it's a waste of money. It's ridiculous--my husband and I search every night for something to watch and we end up watching Netflix. I certainly identified with your feelings about dropping your son off at college. I usually cried the whole way home after dropping our boys off for the first time. So hard to let go. Congrats on the graduation! I'm not looking forward to it. I know I'm going to miss him a lot! YAY!!! I'm glad you received some positive news about the RA! Hopefully the PT (and a little TLC) will work magic for your knees, too. At least it's a running malady and not RA related! I have never lived by myself but I always said if I did I would never pay for cable. I don't watch it enough either. It's just full of bad shows. We cut the cable a few years back. We have Netflix and Amazon Prime (no need for the stick). I'm thinking we may need to invest in a premium channel for the summer, though. We like to watch a show or two most evenings. but there's nothing on network tv in the summer. Sorry about the runner's knee. You know my knees are my weak point (well, and IT, and hips . . . ). But that's really good news about the RA! 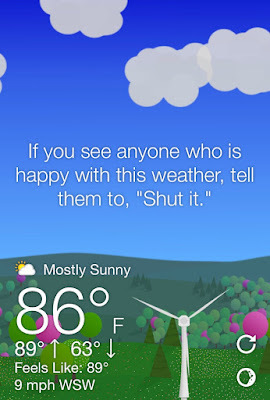 Let's not even get into that crazy weather -- I'm tired of talking about it! How do you get Amazon prime and Netflix without a streaming device? Hooray for the RA news. We tried the antennae and it worked for awhile but now it's doesn't NBC...miss my Today show in the morning. So haven't cut the cable yet. We don't have Netflix or Amazon prime. I like my coffee strong with flavored creamer. I still like half and half! Great news from the doc! Sorry about the runner's knee, but now you know why they've been bothering you. Good luck with PT! It's the craziest thing, isn't it? We never got a DVR, so that's a good thing, right? I'm glad to hear things are better with your RA! I'm an occupational therapist so I know how tough RA and other types of arthritis can be to manage. My boyfriend and I just cut our cable because we barely used it anyways. We have Amazon Prime and Netflix through our Roku TV which is enough entertainment for us! I think a lot of people are starting to go that route. I noticed that Xfinity (Comcast) now has a streaming service. Isn't that interesting? We still have dance show, then prom and graduation coming up. Good to hear RA is better. Do you have Shalane Flanagan's cookbook, Run Fast, Eat Slow? There's a recipe for turmeric pepitas that are tasty and good for fighting inflammation. I will be posting the recipe soon if you don't have the book. I do have the book--I actually reviewed it a couple months ago! Thanks for the reminder! Did you ever think you'd be happy to "just" have runner's knee? LOL, amazing what having a chronic disease can do for approaching other issues. Have fun with your son on the road trip! And yep, there will be tears at the college drop off. I may have even made my husband stop the car as we were leaving campus and borrow one of those "welcome to UNT" signs that were stuck in the ground...I just needed SOMETHING tangible from there, I guess! You are allowed to be slightly crazy when your kid goes to college. It's all about perspective! I'm glad the knee pain isn't arthritis. It was such a relief to see those beautiful clear articulations! Not even osteoarthritis. So grateful. It is OBSCENE what we pay the cable company. But, PoPo won't budge. Have fun with the boys this weekend! I was surprised Mike did agree! But we still need to make sure CBS and Fox work so he can watch football in the fall. That would be the deal breaker. The trip to Madison with your son sounds like fun! And, I'm so happy to hear your RA update! I'm horrified at what we pay for cable, but my husband is reluctant to cut the cord. 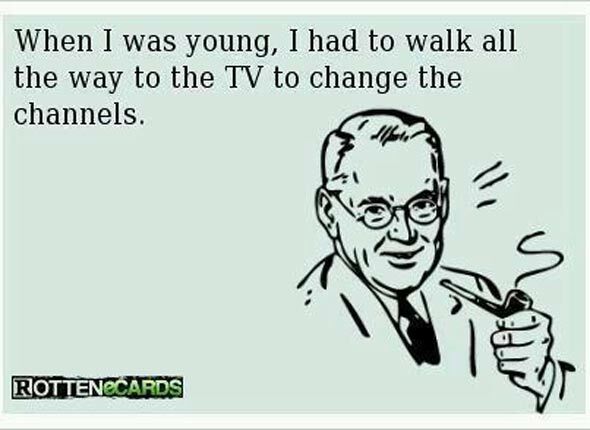 Good for you for working your way up to getting rid of cable! I wish I could get rid of mine!! May is a busy month for sure! But congratulations to you and your son on his graduation! We've talked about it for a while but I finally did it! Woo hoo! What a fun trip coming up with your son! Love spending time with my daughter especially when its just her and me. 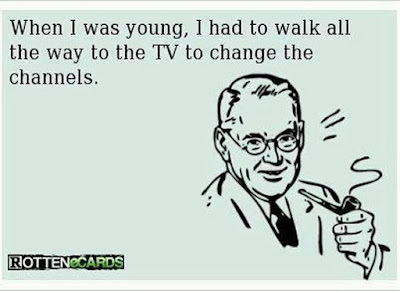 I will NEVER get rid of cable! I lived out here in the boonies with no cable access for years and finally we have cable. I will admit that we don't watch tv that much but I do have my cable shows that I love....Naked and Afraid for one....those ppl amaze me. Congrats to on a healthy check-up, great news!! My parents live in the boonies and they can’t even get cable, so I get it! Don’t you get the local channels at least? Our antenna catches all the local channels. I’d miss the news too! Fantastic news from your doctor! 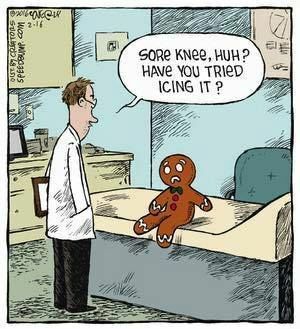 I am such a sucker for a pun -- I love that gingerbread man comic! We are still hooked to cable for all the sports stuff. My husband rolled his eyes but I thought it was funny too! Congrats to your son!! :]! One of my childhood friends recently moved to Madison so I'm hoping to visit her there at some point! Hope you have fun on the road trip! Super glad to hear the good news from your rheumatologist too! :]! I hope PT helps a lot! I hope PT helps too, but I think most of my pain is inflammation from RA. What do I know? I recently cut the cord with DirecTV and it's the best thing! I have a digital antenna and netflix and sling. What more do I need?! So glad to hear that news from your rheumatologist!!! That's really awesome. I am a little surprised that, even with CrossFit, you have "runner's knee" especially since you're working with someone who knows you're a runner. Ah well, hopefully the PT helps and at least it gives you a few more exercises in your arsenal! I don't really believe that my pain is from "runner's knee". I think it's RA. But the xray shows my patellas tracking outward, so hey, I'll do the work to prevent anything bad from happening! It's great to hear that your RA is in "low range" activity! What a crazy May! I am astounded that the school has prom and graduation in the same weekend! How overwhelming! Yes, it was! But now that we're done with all that, I'm kind of sad! Wonderful news about your RA and congratulations to your graduate. Exciting times! Hope PT helps with your knees. It's great that there is no arthritis in them. May is definitely crazy. For teachers, it’s all about the mad dash to the finish line, keeping students on board or getting them on board if they’ve struggled with motivation throughout the year, dealing with AP and state testing, the list goes on. Plus all of the activities for my son. It was definitely a crazy month here too! It's nice that once all that testing and stuff is over, you get summer to kind of recover! We still haven't pulled the trigger on canceling our land line, so I'm sure we'll be hanging on to ripoff Comcast for quite a while. Have a blast in Madison! We had a great time! I'll be sharing more tomorrow. I've been to Madison and really loved it, though I wasn't a runner then and it was in January, so a bit cold with all frozen lakes (couldn't believe that!!). I have shared this post with my friend who has RA, she's on I believe Methotrexate which knocks her immune system completely out, giving her chest infection after chest infection. She might see something useful here about how you handle it, though we're in the UK. Glad the runner's knee is just that, though! I've had a bad May for running as it's HOT and I have not taken account of that. Being more sensible now. Your kiddos are up to so much good stuff lately! Congrats to them!! Also, we've been considering dropping cable for awhile now too! I feel like summer might be the time to do it since we are out of the house so much any ways! Congrats to your son, sounds like a whirlwind weekend with prom and graduation. I hope you had a fun weekend together in Madison! Glad to hear you're in good health! Boo to Runner's Knee though as a fellow "sufferer"....I thought running less would make me feel better, but squats are my enemy right now, sigh! Congrats to your son- a trip together sounds perfect too! Good news on the blood work and enjoying that glass of beer or wine- I am sure you've missed it! Great news from the Dr Wendy!! Congratulations on your son's graduation. I didn't cry when my middle one graduated high school but I did cry when we left him at college. Comcast, ugh! I hate them but not sure we can live without them. We do watch a lot on Netflix but there are still some channels both the hubs and I really like that we could only get through them.